Jascha Horenstein was born in Kiev on May 6, 1898. He studied in Vienna with Franz Schreker before moving to Berlin and working as an assistant to Wilhelm Furtwangler. His first appearance as an orchestral conductor was in Vienna in 1922 in a program which included Mahler's First Symphony. During the 1920s he conducted the Vienna Symphony Orchestra and the Berlin Philharmonic Orchestra. As a young man he made the acquaintance of Schoenberg, Webern, Stravinsky, Rachmaninov, Richard Strauss, Busoni, and Janacek, and frequently programmed their music for the rest of his life. He was forced to leave Nazi Germany since he was Jewish. He moved to the United States of America in the 40s (he eventually became an American citizen). After the Second World War, Horenstein returned to Europe and lived in Lausanne, Switzerland. Although a distinguished 20th-century conductor of Russian origin, he is particularly revered for his monumental performances of Mahler and Bruckner. A respected conductor of international stature, Horenstein never became attached to any one orchestra for any substantial period of time. He was admired by his colleagues as a human being of great warmth and depth. In the early days of the LP record, Horenstein was widely known for his Vox recordings of the Viennese masters, particularly Mahler and Bruckner. He derived inspiration from the interpretations of his idols, Nikisch, Walter, and Furtwängler. As a conductor, Horenstein greatly admired Stokowski (and conducted his American Symphony Orchestra) for his broad repertoire and the sense of occasion he brought to every performance. Horenstein was intolerant of routine performances, even from the greatest orchestras. In 1964, he presented Busoni's Doktor Faust in New York. However, despite conducting in France and the US, it was England that proved his performance base from about 1958 onwards (beginning with his legendary Beethoven: Missa Solemnis). He gave many concerts in London (and made many recordings with the London Orchestras) including the London Symphony Orchestra and in Manchester with the BBC Northern Symphony Orchestra. In his later years, he appeared frequently at London's Covent Garden. He died in London on April 2, 1973. His legacy includes legendary recordings of many Mahler Symphonies include: 1, 3, 4, 6, 7, 8 and 9. Jascha Horenstein è stato sopportato a Kiev maggio su 6, 1898. Ha studiato a Vienna con Franz Schreker prima di muoversi verso Berlino e del funzionamento come assistente a Wilhelm Furtwangler. La sua apparizione come conduttore orchestral era a Vienna in 1922 in un programma che ha incluso il primo symphony del Mahler. Durante gli anni 20 ha condotto l'orchestra di symphony de Vienna e l'orchestra de Berlino Philharmonic. Come un giovane che ha fatto la conoscenza di Schoenberg, di Webern, di Stravinsky, di Rachmaninov, di Richard Strauss, di Busoni e di Janacek ed ha programmato frequentemente la loro musica per il resto della sua vita. È stato costretto a lasciare la Germania Nazista poiché era ebreo. Si è mosso verso unito Dichiara dell'America nel 40s (finalmente è diventato un cittadino americano). Dopo la seconda guerra mondiale, Horenstein ha rinviato ad Europa ed ha vissuto a Losanna, Svizzera. Anche se un conduttore distinto 20th-century dell'origine russa, lui è specialmente revered per le sue prestazioni monumental di Mahler e di Bruckner. Un conduttore rispettato dell'altezza internazionale, Horenstein non è stato mai fissato ad alcun'un'orchestra per alcun periodo di tempo notevole. È stato ammirato dai suoi colleghe come umano del calore e della profondità grandi. Nei giorni in anticipo dell'annotazione del LP, Horenstein ampiamente è stato conosciuto per le sue registrazioni del Vox, specialmente del Mahler e del Bruckner. Ha derivato l'ispirazione dalle interpretazioni dei suoi idols, Nikisch, Walter e Furtwängler. 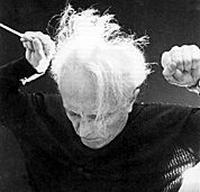 Come conduttore, Horenstein notevolmente ha ammirato Stokowski (ed ha condotto la sua orchestra americana di symphony) per il suo vasto repertorio ed il senso dell'occasione che ha portato ad ogni prestazioni. Horenstein era intollerante delle prestazioni sistematiche, anche dalle orchestre più grandi. In 1964, ha presentato Doktor Faust del Busoni a New York. Tuttavia, malgrado la condotta in Francia e negli Stati Uniti, era l'Inghilterra che ha dimostrato la sua base di prestazioni dal circa 1958 in poi (cominciando con il suo Beethoven leggendario: Missa Solemnis). Ha dato molti concerti a Londra (ed ha fatto molte registrazioni con le orchestre de Londra) compreso l'orchestra di symphony de Londra ed a Manchester con l'orchestra nordica di symphony di BBC. Durante i suoi anni più tardi, è comparso frequentemente al giardino di Covent de Londra. È morto a Londra il 2 aprile 1973. La sua eredità include le registrazioni leggendarie di molti symphonies di Mahler include: 1. 3, 4, 6, 7, 8 e 9.
at length his long career. is priced as if it were Three single CDs. Beethoven Missa Solemnis - Philharmonia Orch.